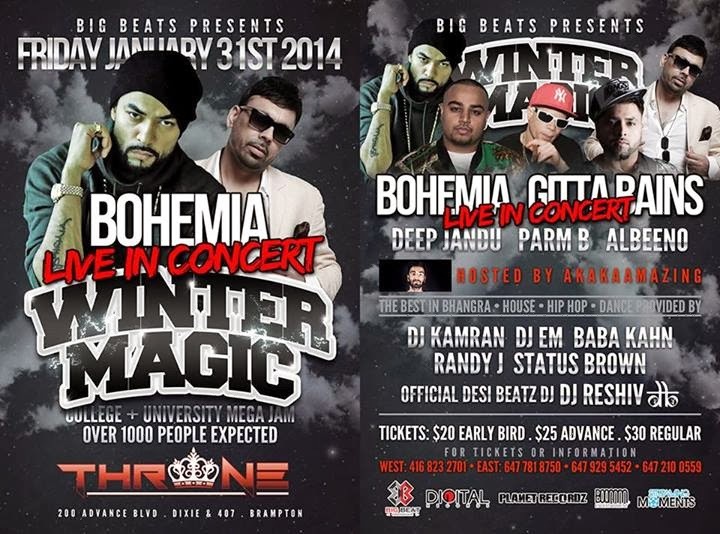 After Bohemia's new collaboration in the year 2014 with Sean Kingston, Sonu Kakkar & many other in his new upcoming song U N Me Bohemia will also do a live concert on 31st of January 2014. This concert will be held Live in Canada the biggest Mega Jam including many big artists like Deep Jandu, Gitta Bains, Albeeno, Parm B & Bohemia himself. Grab your tickets from the information given below this is going to be huge. Bohemia's fans should not miss this oppurtunity.